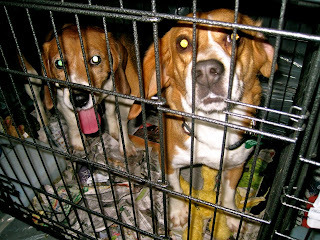 The day before we told you about the Beagle Freedom Project's latest rescue. We are still getting more details, but so far we know that BFP is getting 10 male beagles from somewhere in the Midwest. 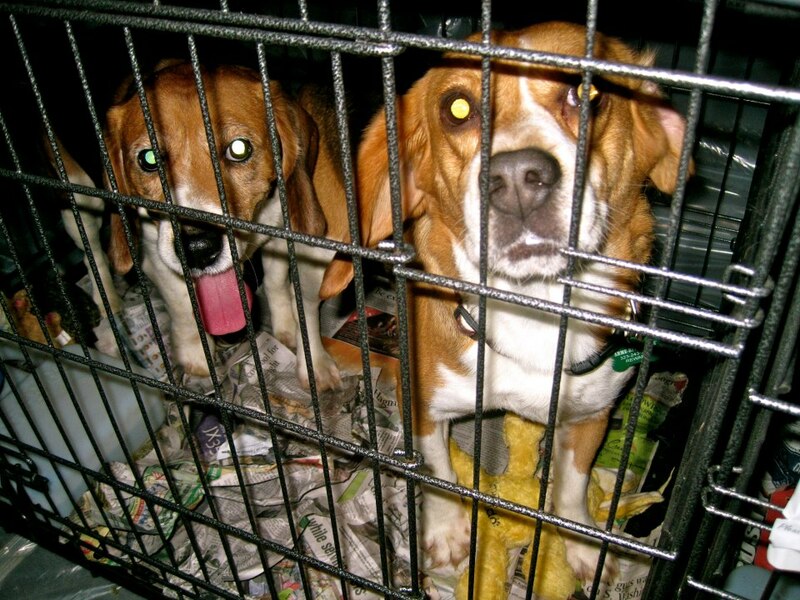 They will then find homes and help the beagles become acclimated to life outside of cages. This is Beagle Freedom Project's 11th rescue. 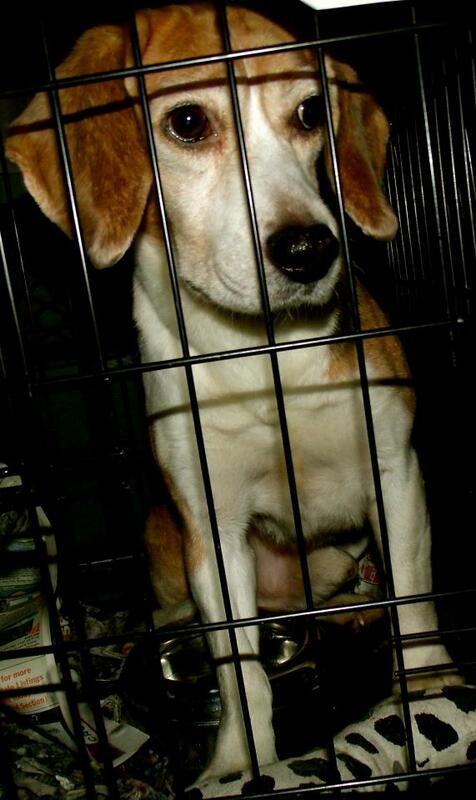 One of the beagles in Beagle Freedom Project's latest rescue. I interviewed Shannon Keith, founder of the Beagle Freedom Project. I posted part 1 of the interview the day before. Here is the second part of that interview, where we continue the focus on the AstraZeneca campaign, and what you can do to find and help lab beagles by you. Aside from writing the emails, is there anything else people can do to help with [the AstraZeneca] campaign? 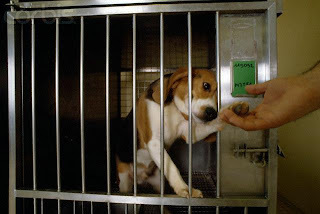 Supporters of the AstraZeneca dogs can do what Beagle Freedom Project is doing and using their ethical malfeasance as an opportunity to talk about the issue. We have done a number of media interviews about dogs in animal testing because of AstraZeneca and influenced countless thousands to boycott AstraZeneca's products and all other products tested on animals. It is our obligation to not let these dogs die in vain, something more profound must be born from it. We will continue our efforts to cajole the company and we are building an international network should one or all of the dogs become available and need homes fast. We at Beagle Freedom Project are also daily inspired by the level of creativity some supporters have in drawing attention to the issue. We encourage supporters to find their own voice instead of this campaign limiting them to email. AstraZeneca's officials keep saying that these dogs can't live normal lives, but you can prove otherwise. Can you walk me through what it takes to get a dog from taking its first steps outside a lab to going home with a forever family? We can cite over 100 examples of these “purpose-bred for research” beagles successfully adapting to home life and becoming treasured additions to families. This is the most cynical of rationale we have ever heard. The journey each beagle takes from the lab to the couch is different for each dog and depends on the violence they suffered in the labs. Some of our beagles adapt right away and love people, soaking up as much human affection as they can. Some of the other beagles take much longer to trust and know that they will not be harmed. One of the dogs just for the first time climbed on his adopter's lap, after 8 months of living in her home. The key to their success is a lot of patience and unconditional love. Beagle Freedom Project has a trained group of foster parents who take the dogs in once they have been released and received their initial veterinary treatments. We work with these fosters closely to assess each dogs progress and personality so we know they when they are ready for a forever home and the right one at that. What can people do to help Beagle Freedom Project, especially if they don't live in California? People can help Beagle Freedom Project no matter where they are. First, it should go without saying that we always need financial assistance. 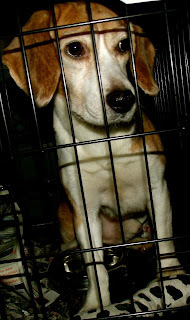 The rescue missions and veterinary costs can often be prohibitively expensive, but we will never let a laboratory beagle be killed simply because of money. We are always grateful for any donation. Third, buy and wear our merchandise. So many people have contacted us because they have see a stranger wearing a t-shirt and then looked up our website! Fourth, never every buy anything tested on animals. Be a cruelty-free shopper and encourage all your friends and family members to do the same. If people know of a lab with beagles near their home, what can they do to try to reach out to that company? The only reason that these laboratories exist is because they are successful at keeping it their dirty little secret. The more exposure they get, the more susceptible to public scrutiny, and the better the chances at getting legislation passed to end this once and for all. Please share our organization with everyone. Watch and share the videos and be a voice for the thousands of dogs suffering in labs right now who cannot speak for themselves. 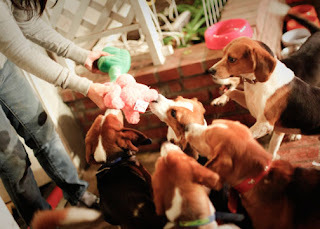 Some of the beagles in Beagle Freedom Project's latest rescue. Last day of Global Pet Expo. "Hey Mom, I'm gonna stay home, if that's ok with you." Some really awesome cat toys from the Pet Links System. Another awesome grooming tool for cats. Like mitts, bath towels, even bathtub drains. PetSafe makes all kinds of products, and you may not even know you have them... from toys to water dishes to harnesses. Lulu's harness is from PetSafe and I never even knew it. This year they came out with 40 products, including new smoked meat treats that Lulu loved. Check these out! Boots and socks for all kinds of weather. We'll be trying these out. They are from Canada. RefinedKind made these awesome cat box covers! I wonder if this would work for Miss Galadriel. You've probably seen this catnip company in the stores. I got a plant to take home and try out. At least two companies are selling Garfield toys. Who doesn't love Garfield! They had almost everything at Global Pet Expo! My pictures from the Expo probably represent a tenth of the products displayed. Hopefully over the next few months I'll have lots of reviews and new products to show you and tell you about, including products from Natural Balance, Nutro, Jones Natural Chews, Samsung, Critter Zone, Anxiety Wrap, Thundershirt, Bayer and More! My first trade show! It was an amazing experience. Check out the rest of our Global Pet Expo coverage. Lulu made a big splash at Global Pet Expo Thursday. Check it out. Lulu and I skipped a breakfast Thursday morning, since I didn't want to disturb anybody. If Lulu saw a dog, she'd probably start barking in the middle of some big wig talking. That proved true quite often. Take a look at who Lulu met today! There was a bit of barking online, but really Lulu did quite well while we waited for the Dog Whisperer. I told him that six months ago this wouldn't be possible with her. He asked how I was doing, though. Good question. And I know, I still have a lot to learn about that. We also fitted Lulu for some product samples. These are Doggles! Lulu is not thrilled by them, but they look cool. They are also good for her eyes, particularly when we're in the car. Next was a Kumfytailz harness, designed to keep her core cool in the summer time. There's Angel and Pepper of Pepper's Paws. We kept running into them. But the two eventually got to be ok with each other. We also checked out Multipet International, makers of particularly nostalgic dog toys. She got to meet Woody Woodpecker! Thirsty pup! We stopped to check out some booth, and Lulu quenched her thirst at the Modgy booth. Modgy sells a special clip on travel bottle and bag that you can use when traveling with your dog. By now Lulu is slowing down, and so am I. She laid down at one point next to Macaroni Kennedy, one of the presidential pet stars on the floor of the press room. Notice that she's wearing her Thundershirt in all these pics. We got lots of questions about the Thundershirt and how it works. We talked about it on our blog. We also got a sample of the Anxiety Wrap, which is a different brand. We are going to test that out too and see if it's any different. You can read my Thundershirt review here. Lulu was too tired to sit for our final pics at the expo Thursday. But this gives you an idea of how big this expo is. We'll be back to wrap things up tomorrow! Check the rest of our Global Pet Expo coverage. Global Pet Expo is here! I made it through the exhibit hall today. Here are some pictures from Day 1. Animal Planet costumes, for the pet that dreams of being another animal... or a dinosaur. A kitty for the kitty litter? Cat-shaped boxes from Japan. Coming soon -- swim gear by Body Glove. Make Duncan Hines-style cakes in the microwave. The Merrick/Castor and Pollux booth. I think Lulu needs this. Natural Balance is introducing a new low-calorie formula! Puppy Bowl at the Animal Planet booth! Rock out with your dog out! Bayer, makers of Advantage, and Nutro. We are just one day from the Global Pet Expo in Orlando! And the last thing we will tell you about is our favorite: the city of Orlando. I was particularly upset when Travel & Leisure magazine released its annual list, and tourists gave Orlando a 20 for pet-friendly, but Orlando residents gave the city a 26 -- down from last year! Orlando often gets the short-end of the stick when it comes to these polls, but I think this one is pretty unfair. Orlando is very pet-friendly. Sure some of our biggest luxury hotels don't allow pets, and Disney is very pet-unfriendly, but there's lots of pet friendly places. Orlando has lots of leashed and off-leash parks. Orange County alone has eight dog parks, the closest to the convention center being Dr. Phillips Dog Park. Then there is Fleet Peeples Park in Winter Park, and parks in Casselberry, Winter Springs, Lake Mary and Sanford. In fact, Sanford's Paw Park is considered a top park in the country. Florida allowed doggy dining on patios starting in 2006 (good thing this is the Sunshine state, huh? ), and local governments and restaurants have been getting on board ever since. Orlando was one of the first cities to allow dogs to join their owners. Near the convention center, Houlihan's, Brickhouse Tavern, and Cafe Tu tu Tango all have pet-friendly dining. Just up the road on Sand Lake Road is Cariera by Castelli, where Lulu enjoys the meatballs. A friend says she often brings her dog to Cantina Laredo as well. Most places with a patio allow dogs, I find. That includes most of the restaurants along Park Avenue in Winter Park, and in downtown Sanford too, where Lulu and I enjoyed German fare at Willow Tree Cafe. Looking to get your pet a Florida souvenir? Orlando has lots of pet-friendly shops and boutiques. Woof Gang Bakery is an Orlando-based company with several locations all over the area, including three in Orlando itself, and one on Sand Lake Road. There's also Bark Avenue Bakery on Sand Lake Road. There's also Pookie's Bakery on Fairbanks Avenue in Winter Park, just 15 minutes up the road on I-4. In fact, many Winter Park shops allow dogs inside, especially on Park Avenue, where you can get lots of kitschy pet items at stores like The Doggie Door. We have lots of pet events, with names like Mardi Paws, Pet-a-Palooza and RescueFest! You can find a pet-friendly event almost every month in Central Florida. We even have a Doggy Art Show in April. While you are at the Global Pet Expo, say hello to some of our local vendors, like Wash 'N Zip pet beds, and Pet Party Printz, a wrapping paper that's safe for dogs to tear apart. So no, you can't bring a dog on Disney property, and many of our top luxury hotels don't allow dogs (but many treat dogs like kings and queens). But I've given you the names of just a few places that love pets. Consider checking them out, and consider Orlando for your next pet-friendly vacation. We are counting down to the Global Pet Expo -- now just two days away!!! We are talking about clean teeth today. We didn't brush dog's teeth when I was growing up. We never seemed to have an issue either. But these days, it's important for dogs to have clean teeth, for the same reason it's important for humans: bad breath and bad teeth can mean bigger issues. But since Lulu never had her teeth brushed as a puppy, she's not actually fond of the process now. TropiClean has many teeth products, but this is good. For one thing, you only have to put two drops on both sides of the dog's mouth. For another, the dog then does all the work. The problem is, of course, Lulu can't stand it. So I normally have to sneak up on her when she's laying down. Otherwise I have to chase her around the room. It's had to tell in the picture, but her teeth are much better than they were.